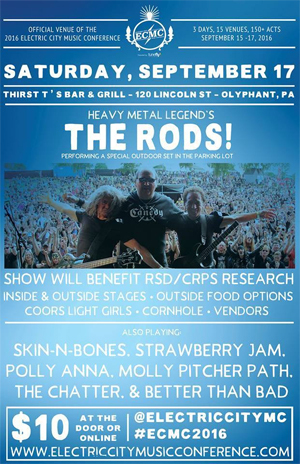 Veteran New York heavy metal power trio THE RODS have been confirmed to headline a special outdoor concert at Thirst T's Bar & Grill on Saturday, September 17, as part of the 2016 Electric City Music Conference. The event, which includes a music festival, music conference and music award ceremony, takes place every fall in Scranton, Pennsylvania. The ECMC takes place across multiple venues throughout Scranton (and the surround areas). Over two days (Friday and Saturday), Downtown Scranton is transformed into a music hotbed. Bands from across the United States descend upon Scranton to mix with NEPA’s vast talent pool of local bands. Scranton’s best bars and venues play host to a plethora of music that spans all styles and genres. The ECMC strives to bring national level touring acts to Scranton, PA to provide music fans with an exciting line-up and to allow local bands to network with bands on the rise.